The mental concept and the physical details of maps guide the everyday course of human travel, where the features of a particular country or a city can be easily accessed online or in a guidebook. For migrants and refugees, the map is more of a geographical route of escape and arrival in a safe destination where the details of the map are perhaps less important than word-of-mouth knowledge of borders, checkpoints and pathways. Sivan Rubinstein is one of the five choreographer/dancers who make up the current Swallowsfeet Collective. She has a family interest in maps — her father is a cartographer — and has thought deeply about their significance. She has used maps as signifiers of the world in which we live, as a philosophical entity that embraces all our activities. In MAPS that she presented in 2017 three dancers begin by creating a world map on a bare stage using white salt. As we sit around watching this map choreography, the shape of the world as we know it — or as we are used to seeing — takes form. The dancers describe it in terms of time differences and differentiate between the geological, the political and the social map. With their steps, meetings, confrontations and incantations they then transform it, erasing the contours, the seas and the landmasses with their bodies in a poetic analogy with the way governments have over the ages settled, pacified, conquered, seized, appropriated and robbed other lands as a measure of their power and influence. MAPS finishes, however, on a note of spiritual optimism with the tracing in the salt of a universal Mandala. This year Rubinstein has developed the concept further, joining forces with the temporary home of the Migration Museum housed in the London Fire Brigade engine workshops on Albert Embankment in Lambeth and with Dr. Sarah Fine, a senior lecturer in philosophy at King’s College London to present Migration Through Dance. As Rubinstein says, ‘dance is the movement of the map’, and within the museum’s migratory environment she has again created the outlines of a world, not out of salt but out of white tape in a configuration by Hamish MacPherson. 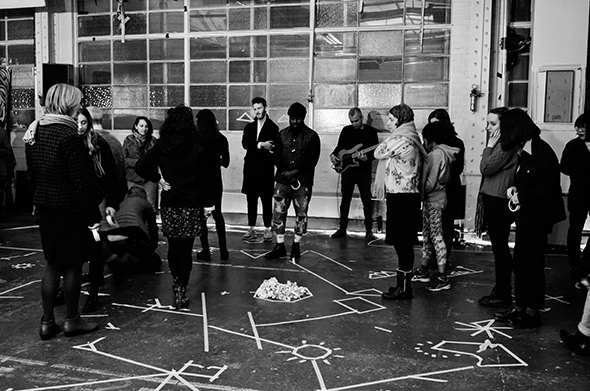 We sit around three sides but this is a participatory performance called Active Maps with guitar accompaniment from Liran Donin; those who wish to be involved are invited to populate the map. Rubinstein invites us to walk our own migration and to land where we consider home; there is a large concentration of feet over England. She then invites us in turn to stand somewhere on the map where we don’t feel welcome and where we have family or loved ones. If the map was a plan of a house, where might we build an extension? It is the kind of game that could be played on a stadium scale. Perhaps the most controversial suggestion is to pull up the tape and place the former borders of our world in a sticky heap in the centre. What results is a different kind of space made up of connections between us but the rolling up of geographical borders causes some discomfort because of our attachment to them. Rubinstein suggests we mark out our own world, but this is more problematic; the results seem to indicate as much our individual presence in a fluid landscape as it represents a new map. Interestingly there are very few borders but rather dots and open lines crossed by others, as if designed by Paul Klee. We are approaching what Rubinstein calls ‘a desire map’ in which our feet are grounded but our minds are free to roam. And then she suggests we pull up the result of our communal geography too and add the tape to the existing ball that is then ceremoniously and respectfully set to one side. The final stage in Rubinstein’s project, Ports of Pass, gives the stage to five dancers from Loop Dance Company and Swallowsfeet Collective who dance their passports. What is it like to take on an identity as a travel document? Harriet Parker-Beldeau stamps herself with fists against her chest repeatedly and the effect of the gestures suggests not an administrative experience but an agonising one. It is a reminder of the psychological barriers that travel can throw up; the cueing like cattle at border controls, the questioning, flight restrictions, security checks and airport navigation; Daisy Farris pulls herself from one direction to another as if listening to contradictory announcements. There are intense walking paths where the performers pass each other but do not meet, breaking off into individual partnerships and groups that seek connections. As with maps, there is no ending to this journey; a final running pattern attains an expression of unison without ever arriving at a destination. Active Maps is part of a research and dance production called MAPS, commissioned by Creative Europe’s EU-funded programme, Pivot Dance, The Place (UK), Dutch Dance Festival (Netherlands) and Operaestate Festival (Italy), and with the support of Arts Council England and King’s College London. Ports that Pass was commissioned by Loop Dance Company, and made with the support of Arts Council England, the Israeli Embassy in London, and Turner Contemporary, Margate.